Everyone loves chestnuts, right? Whether you roast them on an open fire or prefer to buy them pre-shelled in a vaccum packed bag, they are a delicious seasonal ingredient that can be used in soups, salads and sides alike. Before I share recipes with you that call for you to roast and shell your chestnuts, I wanted to share the process with you. It really is easier than you think to create a mini winter wonderland in your own kitchen. From late October, you should be able to find chestnuts in almost any store – they are not a specialty good requiring a trip to high end markets. I find myself coming home with pounds of chestnuts at a time. Chestnuts have a lower calorie count than walnuts and almonds and contain very little fat. If you buy them raw and in the shell you may be asking how to roast chestnuts. Here’s a simple process to get them ready for your table. 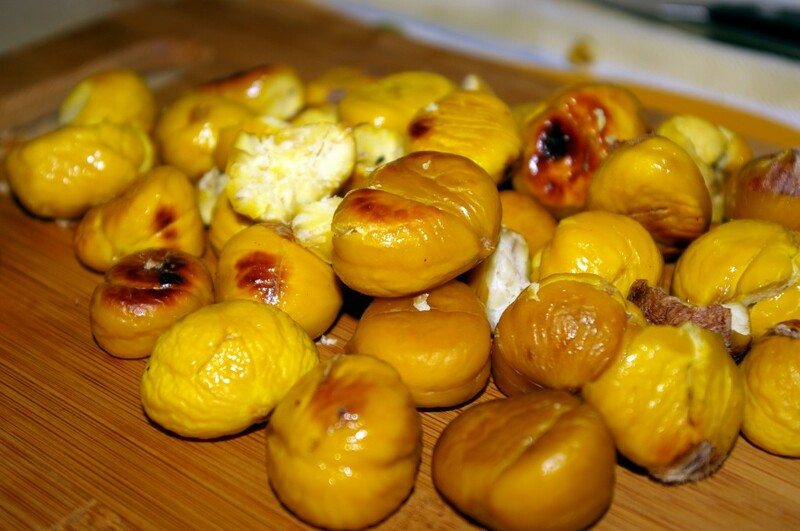 Before you roast the chestnuts, you need to pierce the shell with a knife. You can use the sharp tip of a knife or a metal skewer, wood skewers like the once you use on the grill will snap if you try to use one of those. A small slit, no wider than your pinkie finger, is all you need to let the air out as the chestnuts cook and prevent them from bursting. I like to use my cast iron skillet when roasting chestnuts. There’s no real need for oil but I like the aroma of coconut oil when cooking, and if any of the chestnuts do burst the coconut oil is a good accompanying flavor. Put a teaspoon of coconut oil in an 10 inch skillet and put on a medium heat. Once the skillet is warm, put your chestnuts in the skillet – and make sure there is a little space between them. Do not layer them on top of each other. Set a timer for fifteen minutes but don’t stray too far, you will want to shake the skillet every three to five minutes so the chestnuts don’t burn. If you plan to cook the chestnuts more once you have shelled them, this will be plenty of cook time. If you want to eat them right away, you could cook them for another five minutes, ten at the most, before they start to burn. 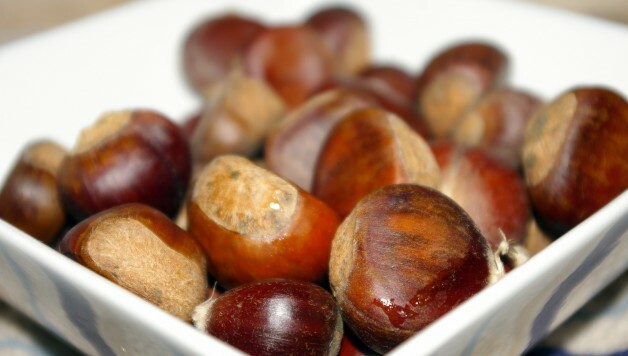 Remove your chestnuts from the heat and let them cool for about ten minutes. 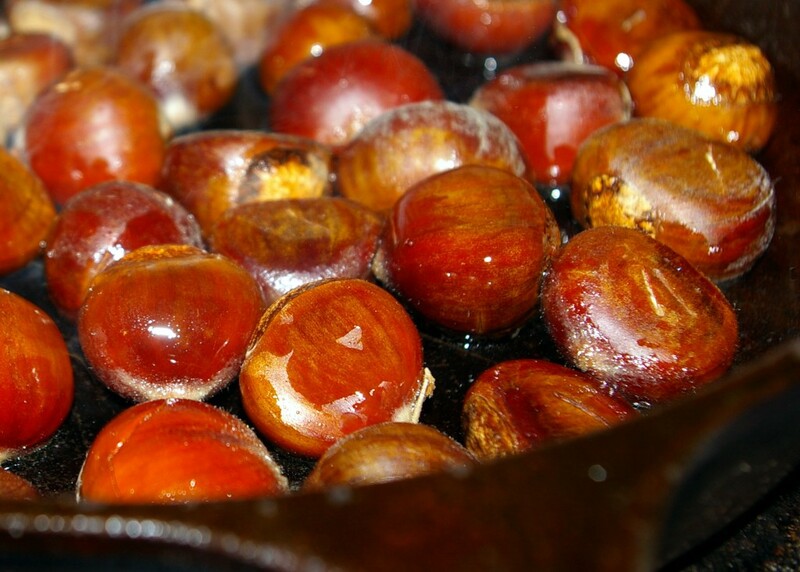 If you did use oil, you may want to set them on a towel so the oil can be absorbed before you touch the chestnuts. Information! 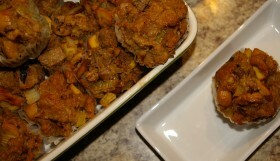 I love putting home roasted chestnuts in my stuffing muffins. Once your chestnuts have cooled to the point that you can touch them, it is very easy to shell them. Some may have split open during cooking and you just have to peel back the hard outer layer to get to the nut itself. For the chestnuts that need a little extra help, I like to use the “Iron Chef Garlic Method” and illustrated below. First, place the chestnut on a board. Place the flat edge of a chefs knife over the chestnut then place the palm of your hand on the knife. Apply light pressure until you hear the shell crack. 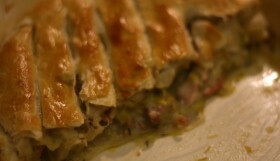 Don’t use too much force as you could easily squash the chestnut, the inside is fairly soft once cooked. Life the knife, peel the shell and set aside. There you have it, chestnut roasting 101. 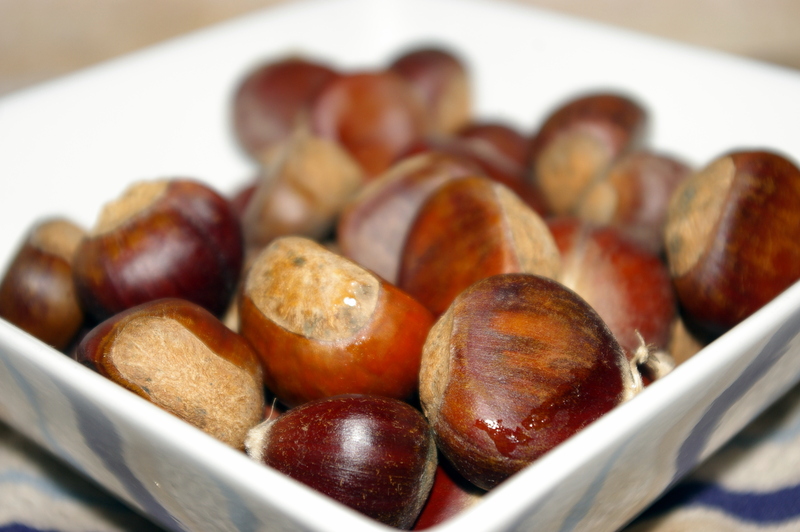 Enjoy this winter treat while you can – what is your favorite chestnut recipe?